4 Cycle Fat Loss Review (2019)- Eat More Carbs and Lose Weight? 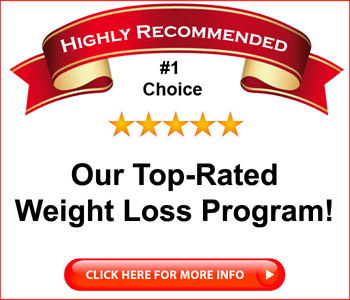 4 Cycle Fat Loss Review – Eat More Carbs and Lose Weight? Do you want to lose weight? Of course you do. Not because I know anything about you personally, but because you likely wouldn’t be hear reading this if you weren’t interested in dropping a few pounds. Most people probably could stand to lose a pound or two, but frankly, it’s hard. Why? Because most weight loss plans involve eliminating one or more things that you really like in order to work. Sometimes it’s temporary, and sometimes you’re supposed to give these things up forever. No one wants to give up fats, or sugars, or carbs, and that’s part of the reason why so many people seem to find 4 Cycle Fat Loss to be appealing. This weight loss program by Shaun Hadsall not only allows you to eat carbs, but the sales page says that you can even eat more carbs and still lose weight. That’s way outside of conventional thinking that you encounter in the weight loss business these days, so I thought I’d take a look. Can you really lose weight while eating lots of carbs? Is 4 Cycle Fat Loss a scam? Click here to visit the 4 Cycle Fat Loss Website. 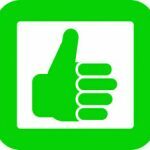 Read on for the full 4 Cycle Fat Loss review. 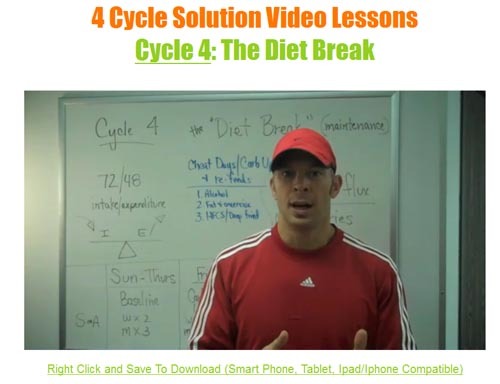 4 Cycle Fat Loss is sold as a series of downloadable books in PDF format. You can download at any time of day and delivery is instant. You can read these books on your desktop computer and many portable devices. Frankly, it’s a pretty big download; I received something like 15 files in the download. The main parts of the 4 Cycle Fat Loss course are divided among five books – the Quick Start Guide and the four Cycle books. The Quick Start Guide is the best place to start, as it gives you some idea what the 4 Cycle Fat Loss system is about and how to weave your way through the many books you’ve downloaded. The Quick Start Guide is 62 pages, and gives you an overview of the system. Basically, the idea is to break the eating patterns you’ve established, and retrain your body to use carbs more efficiently. You’ll then be given a schedule for which of these groups you should eat for a given meal, day, or week. Each of the four cycle books runs about 30 pages, and they’ll offer an explanation for what you’re going to be doing during that portion of the cycle, why you’ll be doing it, and what you’ll be eating. You’ll have a chart for each day of the cycle that explains what you’ll be eating that day (high fat, low fat, high carb, low carb, etc.) After that, it’s just a matter of eating from the appropriate food groups on the appropriate day. 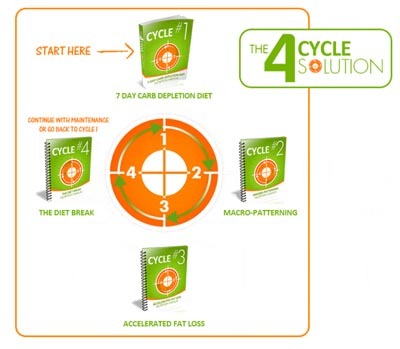 The 4 Cycle Fat Loss system is designed to get you to a point where you’ve lost weight, are more fit, and will be able to eat from the “maintenance” plan from that point on so that you can keep your body in optimum, “fat-burning” mode indefinitely. The bonus videos are helpful, as Shaun sort of walks you through each of the four cycles while making points on a whiteboard. The videos are about 6-7 minutes long, though the audio quality is only so-so. While the 4 Cycle Fat Loss books are well written, I did find the overall plan to be a bit complicated to follow. There’s no real meal plan per se; at least not in the sense of “eat this for breakfast.” You’ll have to choose a protein, and decide how to prepare it and find an appropriate starch or fat to eat along with it. If you’re the sort of person who wants very specific directions to follow in your weight loss plan, then you’re likely to find 4 Cycle Fat Loss to be pretty confusing. The videos help a bit, but that was offset by the fact that you’ll be working with at least five different books while you’re trying to sort it all out. On the plus side, the 4 Cycle Fat Loss system is quite affordable, and that makes it a good choice for anyone who is interested in losing weight while on a budget. Will the plan work? Probably. Most diet plans, and that includes this one, emphasize drinking lots of water, and eating meals that have responsible amounts of protein, vegetables and carbs while encouraging you to shun dairy and most grains. If you follow this plan while also engaging in regular exercise, you’ll likely manage to lose weight on the 4 Cycle Fat Loss system. If you’re looking for a simple, straightforward, easy to follow weight loss plan, 4 Cycle Fat Loss probably isn’t it. On the other hand, the program is affordable, and it will likely help you lose weight, if you can follow the plan and stick to it. 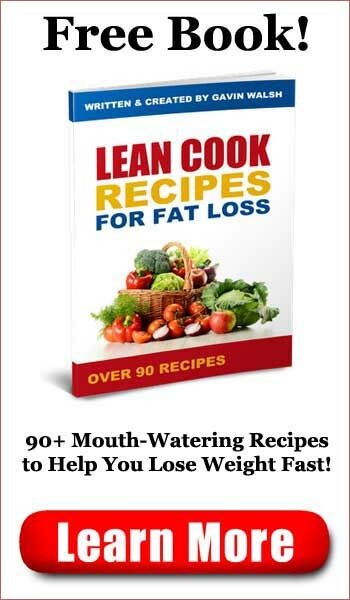 The dietary guidelines appear to be sensible, and there are some bonus books that include some shortcuts that may help you speed up fat lass. 4 Cycle Fat Loss is recommended, though it may not be for everyone.